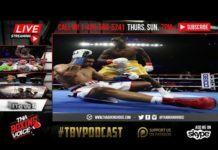 Home Podcasts Boxing 👀Mayweather MMA DEMANDS, Lara vs Hurd REVIEW🔥, Lomachenko vs Davis😱& More! 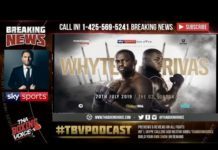 👀Mayweather MMA DEMANDS, Lara vs Hurd REVIEW🔥, Lomachenko vs Davis😱& More! Floyd Mayweather Jr went on Showtime and said basically he will be fighting in an MMA fight next if the money is right with Showtime/CBS/UFC. Do we believe this? Are you hyped? 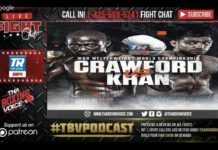 Erislandy Lara vs Jarrett Hurd review. In a great fight Hurd narrowly won a decision against longtime champion Lara. Jermell Charlo vs Jarrett Hurd next? Speaking of Mayweather, he also spoke about negotiations for Vasyl Lomachenko vs Gervonta Davis. Is Mayweather throwing Tank under the bus or just setting up a great fight? James DeGale defeated Caleb Truax via controversial decision in a rematch. Where do they go now? Previous articleGGG vs Munguia PPV😒, Lara vs Hurd PREVIEW🔥, Garcia vs Porter ORDERED👀& More!